Patterns of culture are notoriously difficult to define and locate. This is true to some extent of ‘high culture’ (literature, the performing and visual arts), and much more so of ‘popular culture’ in the sense of the orientations, outlooks and creative productions of subordinate social groups (including both ‘mass culture’ and the problematic notion of ‘political culture’). Furthermore in asking about degrees of divergence between the two Germanies, can one even draw a clear baseline from which to start? There were clearly differences in religious allegiance, types of social organisation and forms of political attitude and behaviour between different social groups and in different regions of Germany before 1945. 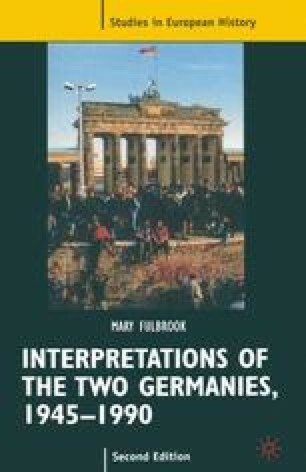 It is difficult enough to characterise the cultural patterns of any one group; to seek to do so for a whole state would seem sheer folly, if it were not for the fact that this is done all the time when people speak of, for example, ‘national identity’ or ‘national character’, or make sweeping contrasts between the supposed personality types of East and West Germans.